My daughter Frankie when she was 8-years-old riding her Standard Jr. on the sidewalk outside our former house on 54th and Lloyd St. 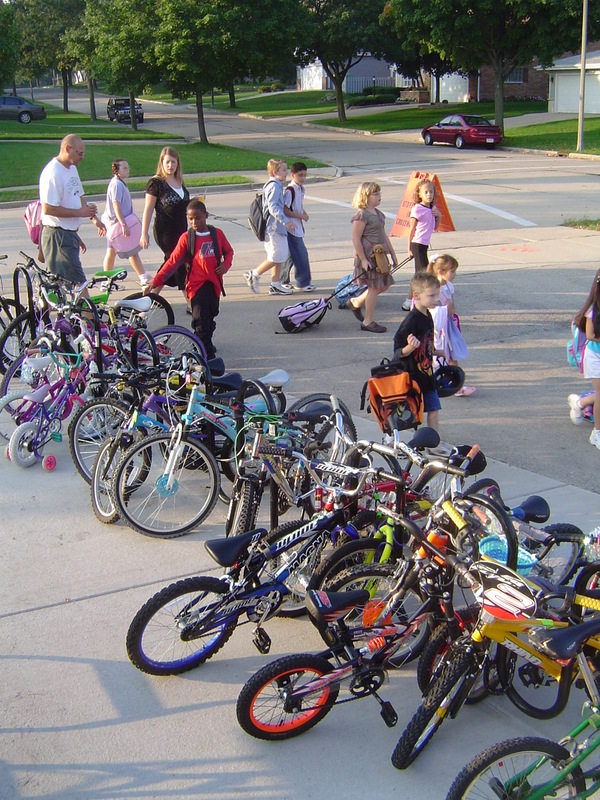 Someone on the Milwaukee Bikes to Work Yahoo Group recently asked at what age do parents allow their kids to bike to school. The percentage of U.S. students who walk and/or bicycle to school has dropped from about 50 percent in 1969 to only 15 percent today. That has as much to do with school siting as it does with safety concerns, since back in 1969, the majority of kids lived within a mile of their public school. But I think the original question is really asking at about safety. In 1969, I was 7 years old and I lived on 86th and Adler. My school was at 84th and O’Conner, a very short walk. But in between my house and the school were four major freeway ramps and a major arterial road. Still, my parents sent me on my way every morning without fear and I walked to school from 1st grade on. I was not walking alone though, because every other kid in my neighborhood went to the same school and they all walked there too. You can see this in the map below. All the kids in my area took a shortcut on a dirt path through those bushes along the freeway fence since Adler curved in the opposite direction of our school. I remember one of the first times I walked home, I accidentally turned west too soon and walked along the wrong side of the fence next to the freeway. I clearly remember staring at my street though the fence and crying because I was scared. I eventually figured out what I did wrong and walked around the fence to take that shortcut though the bushes that I had learned from the other kids in my neighborhood. I never made that mistake again, and I really don’t remember any other problems from 1st through 5th grade when I went to that school and lived on 86th St.
Nobody ever road a bike to school that I remember, but all my friends had bikes and we rode them all over our neighborhood, to the hobby shop in West Allis and on the dirt trails behind Ryerson Steel’s warehouse behind my house. We would hop on our stingrays and tell our parents we would be home for lunch or dinner. They never asked where we were going, and we never really knew. We just headed off and made it up as we pedaled along. Traffic safety seems more of concern these days. 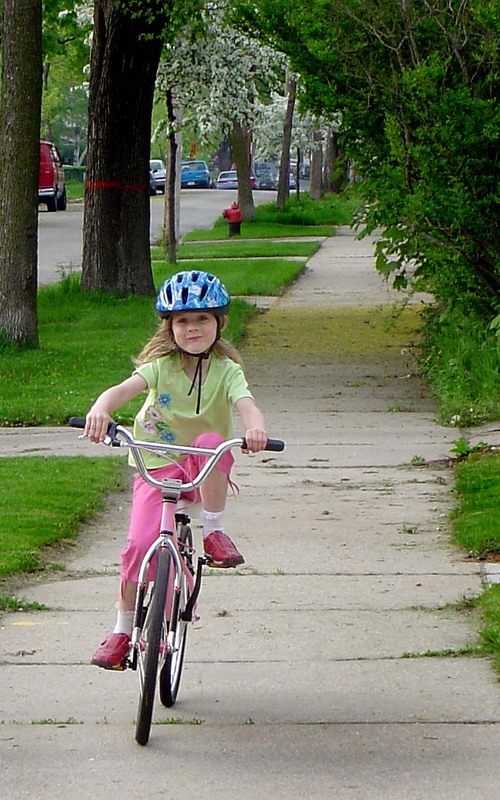 Parents are quick to mention fears about kids on bikes mixing with so many cars out there. But in my situation, to get most anywhere we wanted to go, my pals and I had to ride on a busy arterial next to four freeway ramps. I don’t remember any problems. We rode on sidewalks as well as in the street, depending on where we were going. I don’t remember any lessons in traffic safety, or even a bike rodeo at school. In those respects, most kids today are much better educated on how to ride in traffic and are probably statistically safer than we were in 1969. Parents seem to have greater fears of traffic so they teach their kids about it, which is a good thing. And there are many more bike education programs like Safe Routes to School and local bike rodeos today than there were back the. As far as crash statistics go, the number of bicycle crashes, and fatal bike crashes had declined. In 1975 there were 1003 fatal car/bike crashes. In 2008, according to NHTSA’s “Traffic Safety Facts for Bicyclists and Other Cyclists, there were only 716 cyclists killed. Overall crash numbers are down even more since then as well. In part due to a Safe Routes to School program at Cooper Elementary School on Milwaukee's South Side, many kids do walk and bike each day. If it is statistically safer to ride a bike and kids are better educated about traffic safety, why don’t more kids bike and walk to school today? First, most kids don’t live so close to their school anymore. Integration, “magnate” schools that draw kids citywide, other issues today have most kids live quite far from their school, at least in Milwaukee. This is not as true in the inner ring suburbs like Shorewood, Wauwatosa, Whitefish Bay, etc. And in those communities, many more kids walk and bike to school. In the outer ring suburbs, schools tend to larger and are located much further away, so there is much more busing and parents driving kids to school. But other than distance to school, I think the same “it’s dangerous to bike or walk out there” mantra that permeates our society is to blame. Depsite the fact that the number one risk of death for school age kids is riding in an automobile, we have this cultural belief that it is dangerous to ride a bike or walk. The same arguments I made in my previous posts about bicycle safety all apply to kids today too. And the culture of inactivity is also a problem for kids. Today, more than 33 percent of children and adolescents in the U.S.—approximately 25 million—are overweight or obese. When physical educations programs are almost non-existent in our schools today, a bicycle trip or a walk to and from school increase opportunities for children to be physically active. We all love our kids and want then to be healthy, happy and avoid risk. To that end, I will discuss bicycle safety and kids in another post later this week. In the mean time, let me know if you walked or biked to school and if you have kids, if they can do the same today. For elementary school we walked, then the years after that the schools were further away so it was always buses I think. Probably could of rode bikes but I think the mindset was ‘it’s too far’ while looking back it probably wasn’t. That said we did ride are bikes all over town in a similar we’ll back for dinner way. I grew up in Glenview, IL. I was always bussed to school. In 6th grade, I wanted to walk home and did so once, as I knew I needed the exercise (I was pudgy), and it was only a mile. There was a major arterial (Loomis Road in Greendale) along the way, so that freaked out parents and school staff, who made a very big deal about how terribly unsafe that road was, back in 1986. I rode my bike frequently after school, down that same terribly dangerous arterial, just never to school, and never mentioned to any adults where I was going or how I was getting there. We lived about 4 blocks from my elementary school and 6 blocks from my high school. My mom wouldn’t let me travel to either unattended until the summer before my freshman year in high school. Literally, she could have watched me walk or bike ALL THE WAY to elementary school from the end of our block and yet she insisted on driving me. I would have loved to have walked or biked. When I was really young, I walked to Beach Elementary School in Beach Park, IL. After 4th grade, I had to take the bus to Beach Park Elementary on Lewis & Beach because I lived too far away to walk. Most kids in my neighborhood walked to school up to 5th grade. When I lived in Austin, TX, I walked to Mirabeau B. Lamar Middle School and A.N. Mc Callum High School. Walking and biking was almost always part of my education. I can’t recall when I started biking to school, but I was pretty young. We often biked or walked to Stone Bank School(outside of Oconomowoc), and it was about a half mile. I still occasionally rode in high school, but Arrowhead was several miles away, so the bus or driving happened much more often. I did ride to work starting in 7th grade until I turned 16. The roads out by Stone Bank were pretty quiet back then, so I never really felt unsafe on my bike, and our parents let us bike just about anywhere, so either they thought it was plenty safe, or they were just happy to get us out of their hair. Awww, I love that photograph! Noah, at age 8, rides his groovy blue Standard Jr. to school too, 11 miles round trip. Damiano Cunego step aside, Noah is the real “Piccolo Principe.” Send me photos Jennifer! The odds of winning my Fun Friday Photo Contest are still very good, and I could use some new entries to put up tomorrow too. I went to high school in a small town (Burlington) and mostly walked or biked. In that town, it is no longer possible. The traffic is insane. A new high school has been built in the outside of town, far away from where most houses are. I think the population has grown by about 30 to 50%, but I would guess the traffic has quadrupled. There is still a quiet, older part of town, but given all the development that has been done to encourage driving, it’s tough for anyone to get around on a bicycle. Lots of small towns in Wisconsin have built new high schools and other schools far away from neighborhoods. Along with that, they have built high-speed thoroughfares around the town. Plenty of benefits to living in the city or a near-side suburb. A lack of land can be a good thing.